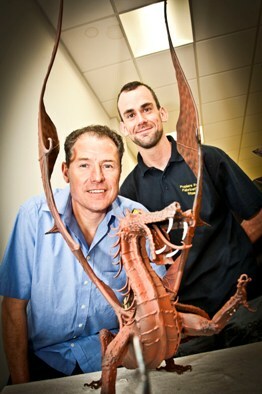 A shopping centre is helping the Welsh dragon to breathe fire. 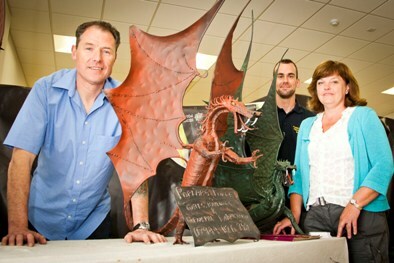 Poplars Forge, which makes dramatic metal dragon sculptures, was one of nine creative businesses given a showcase at the Eagles Meadow shopping centre in Wrexham. Proprietor Steve Gillard hopes his dragons will literally breathe fire one day. His ambition is for them to be used as vents to burn off excess gas at landfill sites across Wales. The companies took over a unit at the centre for a day in an event organised as part of the Wrexham Year of Culture. Also among them were jewellers, artists, a photographer and a company that makes garden products.